We’re committed to providing great customer service to the players and families at Cincy SC. 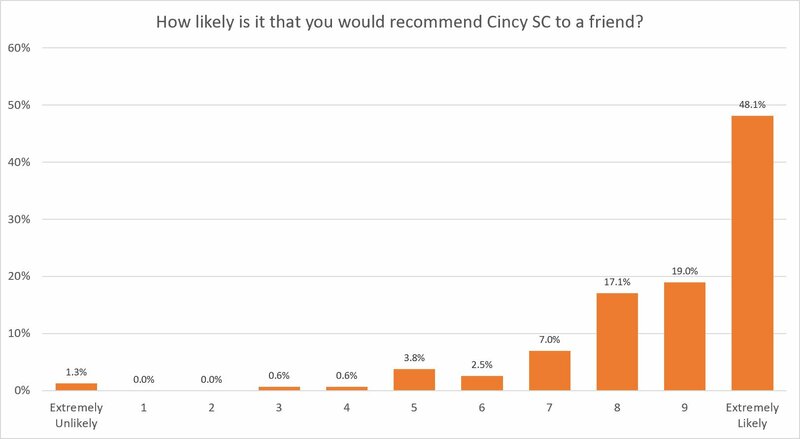 One method we use to help achieve that goal is our annual Cincy SC Customer Satisfaction Survey. 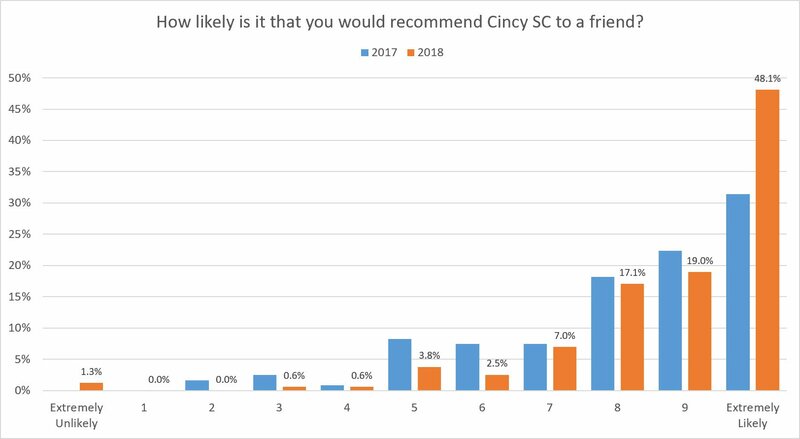 We’re not statisticians, but we think it’s fair to conclude that Cincy SC’s 2018 results look pretty darn good. Here’s an overview of the results and our action plans. 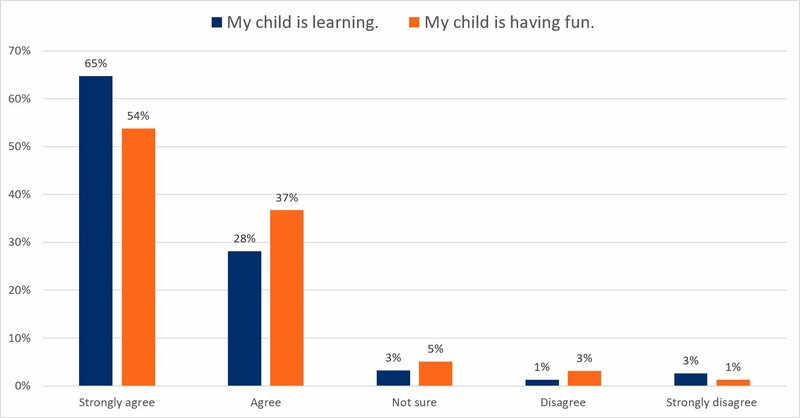 A whopping 57% of our U15-and-under families responded between Oct 2-15, which is pretty phenomenal in and of itself. We filtered the data by team and shared it with our coaches so they can learn and improve. So what does that mean? This question is a business industry standard and it allows you to calculate a Net Promoter Score (NPS). An NPS above 0 is considered “good” as that means you have more promoters (9’s and 10’s) than detractors (0-6’s). A score of 50 is considered excellent. In 2015, our first year, we scored a 35. Last year, we scored a 33.1. This year we’re coming in at 58.3! 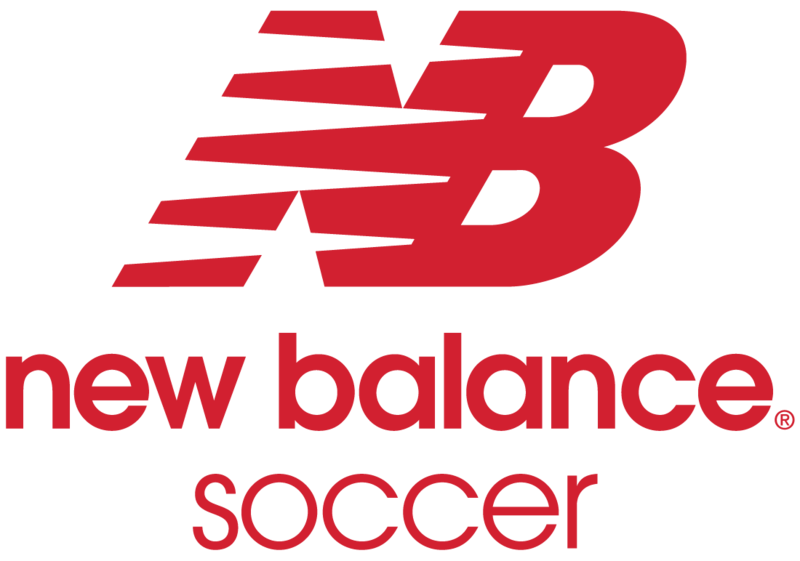 This is not just an “excellent” score — it would make us the #1 rated company in many industries, and probably tops among youth soccer clubs — but there’s still room to improve. We have trouble finding peers to benchmark against, but maybe others will start benchmarking against us! We were pretty stoked about this year’s survey results, especially after our 2017 scores weren’t quite up to our expecations. This year, our families are telling us that we’ve made the right corrections while still pointing out a few areas where we can improve. Our EPIC core values, and how we applied them in day-to-day decisions. Our professional coaches, and their passion for coaching and for soccer. Our focus on player development over winning games. Our sense of Community as a club and attending tournaments as an entire club. Social events like our Meet the Club night, FC Cincy game, and team parties. “Extras” like our Sunday Night Pickup, goalkeeper training, and names on t-shirts. Getting our training facility back. Providing the right level of competition for each team. Ensuring we have the right number of players on each team. Developing our coaches & trainers. Improving play on the field and results. Finally, we believe that feedback is a gift and we wanted to express our sincere thanks for those who responded. Feel free to share your comments or questions on this post or reach out to us. Who are we!? Cincy SC!! !